As you may have noticed, Photobucket is holding some of my photos hostage. The "ransom" is not tremendously high, but instead of paying it, I think I shall consider this a hint to spruce up the blog a bit as I move my photo hosting over to Google Photo Albums. I don't have a tremendous amount of time available for this, so the photos will come back online gradually as I work my way back through the blog and update the posts. I was given this recipe by a friend, but haven't personally tested it, so I'm not making any guarantees as to originality or similarity to Gunnars remúlaði. Stir together well and adjust spices. Serve with fried fish or hot dogs. 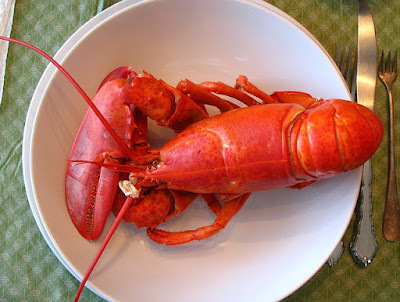 Mention lobster and the image conjured up in most people's minds tends to be of an American lobster. Looks yummy, doesn't it? However, when Icelanders speak of lobster, they tend to mean leturhumar or langoustine (Nephrops norvegicus), a smaller cousin of the American lobster that is found in the north Atlantic ocean and parts of the Mediterranean. The westernmost part of its range is around Iceland and it is found as far north as northern Norway and as far south as Portugal. (Here is a distribution map). I am also working on a new recipe post.